Kahlil Robert Irving creates installations and sculptures that collage pattern color, complex forms, and recognizable objects relating to different signs and symbols from his cultural and social environment. He is currently a Chancellor’s Graduate Fellow at the Washington University in Saint Louis. 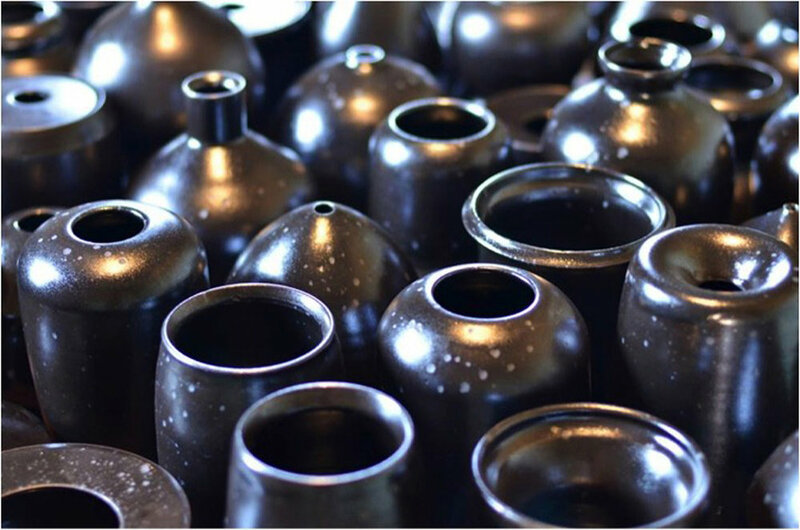 His work has been exhibited internationally at the Bezalel Academy of Art and Design, in Jerusalem, Israel; The International Ceramics Studio, in Kecskemet, Hungary; and the Riga Porcelain Museum in Riga, Latvia. He has also exhibited nationally at The Glassell School and Museum of Fine Art in Houston, Texas; The Milwaukee Institute of Art and Design in Milwaukee, Wisconsin; and the Kansas City Artist Coalition in Kansas City, Missouri. Jess T. Dugan: Let’s start at the beginning. What led you to be an artist? Kahlil Robert Irving: At the beginning, I started making pottery when I was 12 to have fun, then I started to make it a major part of my life. This led to more classes, a high school portfolio development program, and a full tuition scholarship to attend the Kansas City Art Institute. I feel that it was not until my time abroad studying in Hungary did I feel myself an artist. I arrived in February and started working. I was studying with one other student from Israel, David Vladimir Wolf. It was quite unique. He was older than me by almost 10 years. He had such a great look on life; he was like an older brother. As we worked together for 5 months I saw myself in a new way than at home. I was able to make work, exhibit, and prepare everything in ways that were specific to my ideologies and interests. It was outside of the institution that I was able to live by my own direction. When I was abroad, I made a complete transition to a mindset that I had complete control of the whole process of the art works I make. The objects had my ideas, feelings, emotions poured into them. This is the first series of works that I felt were the beginning of my career. I collected items, used my clothes, and studio materials with clay to make what I call my remnant series. Layered Depths is one of the most exhibited works from that series. This work was the basis of how I have created a few series to come. What really led me to being an artist was freedom to express my ideas, feelings, and interests on a platform that was different from the one that I grew up within. After I completed the works they were received and viewers understood some of the information that I added into the works. It was my first time living outside of the USA and did not know the Hungarian language, still do not but I am interested in learning more. I was experiencing so much; I had to encapsulate it all into clay. My work was a means to communicate with others with out having to speak the same language. JTD: What would you identify as the core issues driving your work? KRI: There are a few different motivators that guide the work: color, history, and how items exist in space. I really am invested in keeping my hands busy. I love building and making things with my hands. So I use clay, paint, printmaking as ways to investigate how colors can be applied, built up, or cover objects. The history of how cultures have theorized color is interesting. Many people only think of color existing optically or through light, but I challenge those theories by the presence of colors that are intrinsic to items physically inhabiting space. For example, a black coat is not empty, non-existent, or a black hole; it is a full object. Since the color is intrinsic to its existence the thought around the color and how we physically live with the color needs to be adjusted. Blackness is not synonymous with darkness. Within colonialism demonizing the color Black and idealizing whiteness has added a great barrier within contemporary culture. Current social, cultural, political issues are forcing me to keep readjusting how I balance the toll that has been added to my life emotionally, physically, and spiritually. So many of us are affected and that too is exhausting. I also see my practice as a means of protesting. I am not out on the street but continuing to make my voice present within contemporary art is a way to take up room to talk about issues that are important. In regards to history it comes through researching at the art museum, social movements, and issues that are present within the black community. I research a variety of the history of decorative arts, factory produced objects, and more recently the studio pottery movement of the last 100 years. Why are these aspects of life important? Why is the way history has been presented to us important? Can we trust it all? Finding a place for myself to be a part of the conversation is also a part of what I am trying to do, readjust and rearrange how we see histories, to make a better future. It has been an evolution from the concerns I had in 2013 until now. JTD: In regard to your work, you write that you “create installations and sculptures that collage pattern color, complex forms, and recognizable objects relating to different signs and symbols from your cultural and social environment.” What led you to work in the media of installation and sculpture? KRI: This statement was one of the first ways that I approached describing the works being made in my studio. I felt when people saw what I was making with clay, it became the focus. It was an attempt to guide the focus off of the clay into this realm of really seeing what was and is present within the installations. I am informed by the patterns of how actions are completed and also the patterns that have been used historically to signify specific meanings. How are we coding our world? How do we decode the encoded arena that we are forced to now try our best to survive within? Installations are immersive; sculpture is an extended means of thinking about objects existing within space. I feel that both have allowed me space that painting will never be able to grant the viewer or the maker. I want to demonstrate questions, concerns that I am wrestling. For many years my work was made from a dark space, or I had a shadow that would not pass, so in making installations and sculptures I can give room for that shadow to be cast over the work instead of me. This is a protective tool. Within some works I wanted to conceal and reveal certain aspects of the work upfront and direct. Some ideas within the work are completely not approachable and that’s alright too, but at least the viewer has to rectify their own physicality with the objects that I am creating. I want the viewer to walk around or walk through what I am presenting so that they too not only see what I made, but also try to figure out what is their personal relationship to the physical materials and conceptual underpinnings of the work. The hope is that when people approach the work it is experienced. JTD: You recently had an exhibition at the Bruno David Gallery in St. Louis where you showed a large installation piece I Love who you are, I love who you ain't in your solo show Undocumented. Of this piece and exhibition, the gallery writes, “the series explores racism through decorative arts, ceramics, and sculpture. Thinking through sculpture, Irving uses the ceramic multiple to be metonymic signifier of bodies. This is an interpretation of marching, congregations of people, or even a family reunion. Blackness is infinity; it is strength, it is power. Irving wants to challenge historical notions of colorism, structural barriers that separate communities, and objects that exist within those communities.” Tell me about this piece, how it came to be, and what you hope it inspires in your viewers. KRI: To begin and share honestly, this work came from being harassed for being black and being aligned with a past that is wrought with white Americans torturing Black people. I was harassed by an authority figure that lasted for a while. I spoke up and barely anything happened. I had just moved to Saint Louis to start my graduate studies at Washington University in St. Louis. I thought that I would be in a safe space to work. 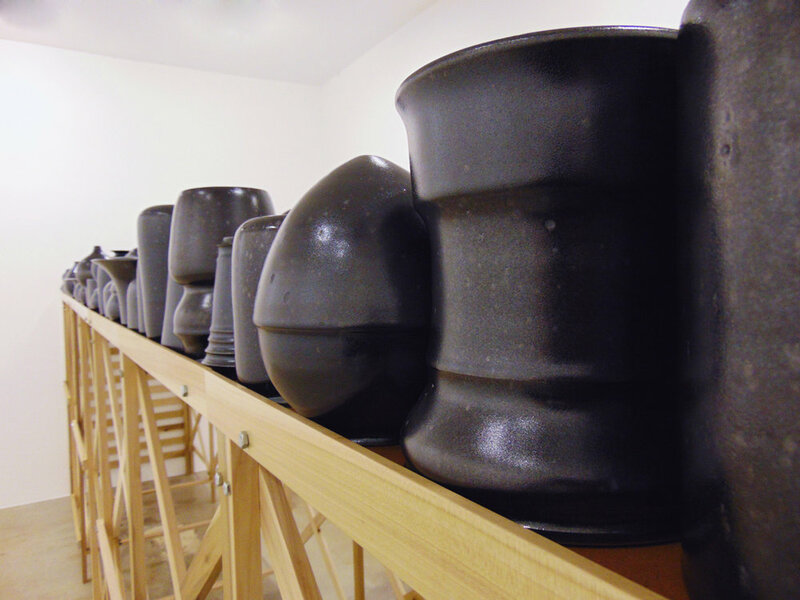 Coinciding with working as an MFA candidate I started working at a local arts institution to create ceramic objects. Remembering my time in high school I would make vases, plates, bowls, cups, teapots, and glaze them all different colors. I thought if I took the same approach to making vases that could be related to historical decorative objects we see in museums then I could relate a contemporary sculpture practice to objects that have been being produced over centuries. So I tried to learn as much about historical objects ranging from garniture, water vessels, daily used wares from 18th, 19th, 20th centuries. It has been a lot looking, seeing, and making. It has been almost two years and the project has reached almost a total of 500 objects. The Undocumented series is an amalgamation of ten different installations. It is the largest series of works I have made to date. It began as an exercise to get my hands working and mind moving conceptually and then turned into something that I wanted to use as a way to engage a discourse more critically than I had in the past. The first installation was a part of the Pentimento exhibition at the Intersect Art Center. I made the first 49 objects, set them on a found octagonal table and asked people to approach the structure with the handmade objects. I started it all going through what it means to be a community and see your values reflected in the space in which you live and work. As a start, I aimed for that to be the gathering point around the work. As more black men, black women, other people of color, queer, and non-gender conforming people keep getting attacked the work has evolved into these large installations. I want the objects to be respected, elevated out of the space to be handled, fondled, or fetishized. They must be respected. Similar to how I desire the world I want to live in to be. At one time it was a dream to think we would not have to fight to make our world a safe space but now, we must with all our might! I Love who you are, I love who you ain’t is 20 feet wide, 6.5 feet high, and 3 feet deep. It is comprised of all the installations above. It is a presence of all the time that it took to be produced and also the power I feel that is the community that I am a part of fighting against all that ails our society. 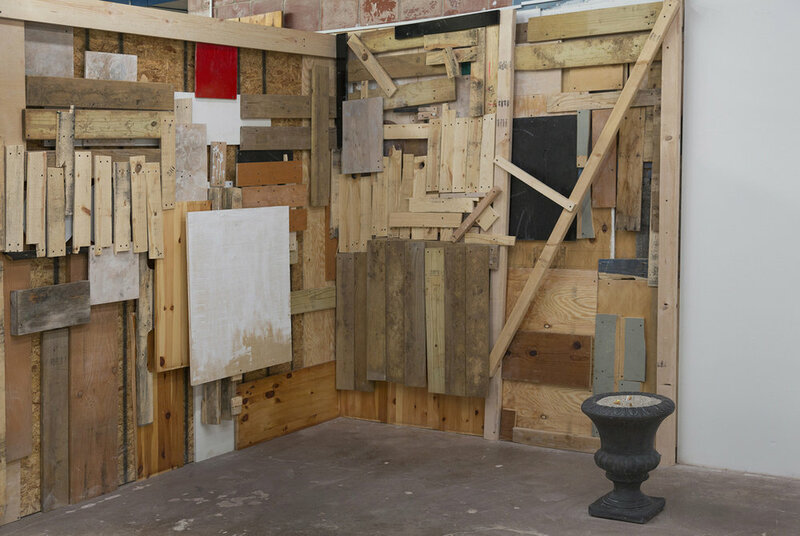 The work is the installation, the wall like platform, and the objects all together. This work was to show that the historical and contemporary struggle is still present and we are moving though it. Within the installation the viewer was given a slim space to pass to the other side of the room. I left that as a means of choice and for the viewer to recognize their participation in recognizing themselves in the work. It was also suggested in the title. I hoped that the viewers peering into the surface of the objects they could see themselves as part of a community. The height is to reflect being above the arrogance, hate, and BS and hope the height represents how much they are worth. Many have asked if I will sell the objects individually. I am working on a possibility to launch a website where objects could be purchased. This is not a stand where people were once purchased as commodity, so if a collector, father, grandmother, doctor is interested in an object they will sign a deed to care for the objects and will not get the choice of choosing the vase they “want.” It will be more intimate and surprising, the object that is received by mail, delivery, or pick up. I take ceramics seriously; I want my viewers to know that also. The conceptual depth that exists in all materials is important to me. As an artist I am still Kahlil Robert Irving and how I perform or exist in my life is still a part of me when I am with my partner or with friends. I see art and life as inseparable. So the approach I have taken with these objects is a similar way I aim for people to start to respect and approach others, specifically Black Americans. JTD: To what extent is your personal identity reflected in your work? As an artist of color, do you feel a responsibility to make a particular kind of work or to position your work in a certain way? KRI: My personal identity is not necessarily reflected in the work that I make but my concerns that deal with my cultural and ethnographic background are. I am examining aspects that affect us all and add those details or use those references as points to perform research, make objects, decorate installations. I do not feel that I have a responsibility to make work about being black but I feel that Charles Baudelaire said it best in The Painter of Modern life, as an artist you make work that reflects the time in which you live. I set goals to capture many aspects of life that are restricted but multifaceted. So when people approach the work, there is a lot to glean from it. I want to explore just like everyone else. I hope that my exploration is taken as seriously as my protest or argument and vice versa. We deserve versatility. I saw Hidden Figures and within that movie was a great example of black women standing up for themselves and their work community slowing recognized them as a people. The main characters stood up and said something because it was the right thing to do in all aspects of life. I feel that within my work, much like many of my ancestors I am fighting the good fight! JTD: You were fairly involved in the events that transpired recently at the Contemporary Art Museum in St. Louis surrounding the controversial Kelley Walker exhibition. Briefly, can you describe your frustrations with CAM specifically and identify your concerns about diversity and representation within art institutions more broadly? I believe what occurred at the Museum was a reflection of how people in power continue to perpetuate the history that we need to be using as a guide to make for a better future. There is responsibility in how much cultural capital art institutions have. It is imperative that they analyze the status quo and make needed changes that call specific issues to the forefront. That means work with fact! Racism and imperialism are strong within the museum system; we need to recognize that. The art institution, although a way to preserve a specific history, it also has a responsibility to ensure that factual, tactful, and systematic adjustments are met. Presenting images of Black people covered with whitening paste, a huge chocolate disco ball, black people white washed, illuminates a lack of self-awareness. How do we complicate images and not perpetuate racism and white men being able to do what they want without question? As someone with power, they do not fund projects, support the ideologies, and present a counterpoint while preparing to consider the work for inquiry! Eurocentrism is not the only way to analyze art and culture: starting with a widening of that dynamic to include analyzing white male behavior is a start. As a group, we can make a difference. It will take a lot of work. I hope the administration at the museum can use this as a guide to make more pertinent choices on the works that they support. I hope all museums can learn! It would change the world if we all could learn how we affect others with our actions. JTD: What are you most excited about in the coming year? What’s on the horizon for you as an artist? KRI: Wow! The coming year? I am completing my MFA, I am a semi-finalist for a Fulbright scholar’s award, and I will finally be completing a goal that I never thought I would reach. I made it past 18 with no kids, no drugs, never been in jail. It has been a journey and I am looking forward to participating in the MFA exhibition at the Mildred Lane Kemper Museum of Art. Currently I am collaborating with Work/Play and will be publishing my first artist monograph on the Undocumented series. Also, I will be exhibiting in a two-person exhibition with Lyndon Barrois Jr. at the South Dallas Cultural Center, opening May 12th. I will be speaking at the Centre College and the University of Minnesota collaboratively with my colleague David Winningham. This is a full year of opportunities. One thing that I am really looking forward to is my first vacation. I have never been on one before and I will be excited to see what comes next professionally. The horizon is coupled with exhibitions and the unknown. I look forward to building new relationships, making new friends, and seeing more of the world!